Because I’m convinced that there’s value in sharing my journey with others, even if I’m an “amateur” when it comes to God and spiritual things. And when I talk about being a “spiritual amateur” I’m just being honest. It’s not some false humility or anything like that. And I’m not saying I don’t know God or haven’t matured in my relationship with him over these past 12 years. I have. I pray, read the Bible and all that good stuff. But yet I feel like there’s a quality of life with God that I’m missing. I feel like my “spiritual life” has been anything but “spiritual.” It’s been more intellectual. Lots of thinking, talking, reading and teaching about God. But not much in the way of real tangible spiritual experiences. I’ve had some. And I’ve even witnessed some amazing miracles with my own eyes. And I’m grateful for everything I’ve experienced. 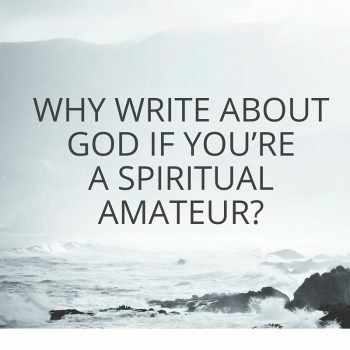 But the point is I still consider myself an amateur when it comes to walking in the spirit, hearing from God and operating in the supernatural. And if I’m really honest I also consider myself an amateur when it comes to love. You know that four letter word that’s we’re supposed to be so excited about as Christians? Well, frankly, the topic of “love” hasn’t interested me much. For example, I’d rather read or talk about a lot of things before talking about loving people. I’d rather learn more how to be more productive, how to impact the world, how to meditate and hear from God, etc. Love just sounds kind of lame. I know. I’m not supposed to say that. But I’m telling you, I’m a spiritual amateur. I know. I get it. But I don’t want it to always be this way. And I feel like God is inviting me on a new journey with him. A journey into discovering who he really is and who I really am in him. So I thought, You know what? I should probably document this journey. Not because I have answers (far from it, I have way more questions these days than I have answers. It’s funny because as a new believer I had more answers than questions! Funny, how that works). And it’s not because I’m an expert and I’m going to “show you” how to do this thing with God. In defense of my opening my soul and laying it bare to the public gaze in this fashion, I may say that it seems to me that we really seldom do anybody much good excepting as we share the deepest experiences of our souls in this way. It is not the fashion to tell your inmost thoughts, but there are many wrong fashions, and concealment of the best is us is wrong. I disapprove of the usual practice of talking “small talk” whenever we meet, and holding a veil over our souls. If we are so impoverished that we have nothing to reveal but small talk, then we need to struggle for more richness of soul. As for me I am convinces that this spiritual pilgrimage which I am making is infinitely worth while, the most important thing I know of to talk about. And talk I shall while there is anybody to listen. And I hunger — O how I hunger! for others to tell me their soul adventures. Do I think I’m going to be another “Frank Labauch”? Well, yeah hopefully! The dude was awesome. I’m totally not ashamed to say that I want to be like him. He was very mystical and yet very practical at the same time in the work he did with the Moros in the Philippines, helping them to read and write. But even if I never get to the place Labauch reached in his spiritual pilgrimage I still think it’d be worth it to follow his lead and to share my innermost thoughts, challenges and wins with the world. Am I scared to do this? Of course. I don’t like “putting it all out there.” I’d much rather write posts like “7 Ways to Become a More Effective Christian” or the “Lost Art of Biblical Mediation” or something very structured and helpful like that. For for now, my goal is simple: be as honest as I can (that itself is no easy task) and to keep pursuing a real relationship with God from my heart. By the way, if you want to do the same thing (share your inner journey with God too) then let us know in the comments below where we can read your stories.